Is Print Advertising Under Attack? Here’s a quick tip for the Firefox users out there. Bookmarks are great to keep a file on all of those useful and informative websites that you come across on your browsing travels. However, there are probably some sites that you use more than others that see you having to execute multiple clicks before you can arrive at your page. The good news is that you can create a keyboard shortcut to get to these sites. 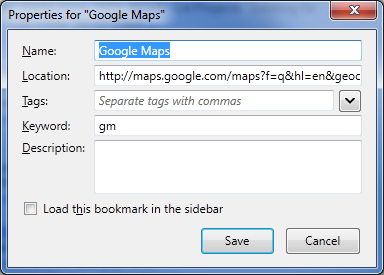 In the “Keyword” box enter in your preferred keyboard shortcut (in the example below I have entered “gm” for Google Maps. So if you want to go to Google Maps, just type in “gm” and press “Enter” and you will be whisked away to Google Maps. Now, all you need to do to search Google Maps from your address bar is type in “gm Sydney NSW Australia” and you will go to Google Maps with the search results already populated. Hope this tip saves you some time and extra clicking!